Dory has her first loose tooth, and, with her usual over-the-top excitement, she cannot stop talking about the tooth fairy. Naturally, this drives her brother and sister crazy. But it also sparks a serious jealous streak in her nemesis, Mrs. Gobble Gracker, who wants all of Dory's attention to herself. But Mrs. Gobble Gracker has decided to steal the tooth fairy's job, and flying around in a tutu from Rosabelle, she heads for Dory's house. It's time for Dory to come up with a serious plan to get the tooth fairy her job back. 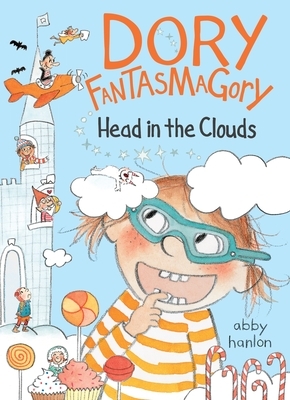 The fourth installment in the wildly popular Dory Fantasmagory series delivers laughs on every page as Dory teams up with her pals, real and imaginary, to save the tooth fairy for all the world's children--and get her dollar! Abby Hanlon has taught creative writing and first grade in the New York City public school system. Inspired by her students' storytelling and drawings, Abby began to write her own stories for children, and taught herself to draw after not having drawn since childhood.